Trouble Getting Approved in Arkansas? Summary of Arkansas Usury Law(s) / Quote: "Legal: 6% Contract: 5.5% (consumer rate capped at 17%) / Judgment: judgment rate on contracts is greater of rates provided in contract or 10%. On other judgments rate is lesser of 10% or current contract limit. / Corporate: No specific rate"
Snippet 1.) Amendment 89 § 2 Quote: "Loans by Federally Insured Depository Institutions. The maximum lawful rate of interest, discount points, finance charges, or other similar charges that may be charged, taken, received, or reserved from time to time in any loan or financing transaction by or to any federally insured depository institution having its main office in this State shall be the maximum rate of interest that was applicable to federally insured depository institutions under 12 U.S.C. § 1831u effective on March 1, 2009"
Snippet 2.) Amendment 89 § 3: Quote: "Other Loans: The maximum lawful rate of interest on loans or contracts not described in Sections 1 and 2 shall not exceed seventeen percent (17%) per annum"
Are you one of the lenders listed below? You can contact us for listing removal. Tony from Pine Bluff and his wife are moving to a new apartment. They are moving to be closer to work to reduce their commuting costs. The move will also bring them closer to the rest of the family who also live in the area. Combined they make a total of $32000 a year working mainly in the service industry. By moving closer to work, they hope to be able to also gain more overtime income or pick up another part time job to augment their income. They need a $7500 signature loan to help them make this transition. The money will be used to pay the first and last month’s rent, moving costs and some new furniture and decorations. They plan to keep it basic and not spend much on decorations or extras. They just do not have the money to squander on anything other than necessities. They have calculated that if the can be approved for this loan with a 4 year term, the payments will be a little more than a $170 a month. At the present time they are spending more than that on commuting costs. The money they were spending on gas and bus fares will be used to pay for the loan and they will also have a much better quality of life. They do not have a lot of income, but they make do with what they have and are working to try and make it better for them and the children they want to have someday. Tony will need to provide documentation of his income and that of his wife. They apparently do not have any other debts. They appear to be hard working people who are trying to make the best life they can for themselves on a relatively small amount of income. Their plans to move are commendable and if successful will definitely help improve their lives significantly. They are always conscious of how much money they are spending and one wonders if they have considered other options. Have they considered finding other jobs closer to where they currently live? They apparently do not have any money saved to cover the first month’s rent and last month’s rent. They need to think about setting some funds aside for emergencies. With their family close by, can they help out with moving costs and perhaps lower the amount of the loan they are applying for? A loan of say $5000 would be easier to approve, would have a lower monthly payment and generate less interest costs over the life of the loan. This could save them money and also help them get that emergency savings plan started. After further discussions with Tony and his wife, they have opted for a lower loan application and are making plans for their move. They are excited and really looking forward to a lot less commuting! If you live in the State of Arkansas and you're struggling to get a loan approval with a bad credit rating we hope our website helps you in some way. 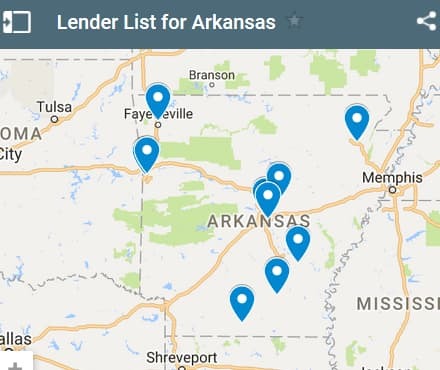 Last 5 debt service loans approved in the State of Arkansas. Source: WFL Lender Pool. Updated Weekly. Principals rounded to the nearest $1000. Relative interest rates listed below in order left to right. 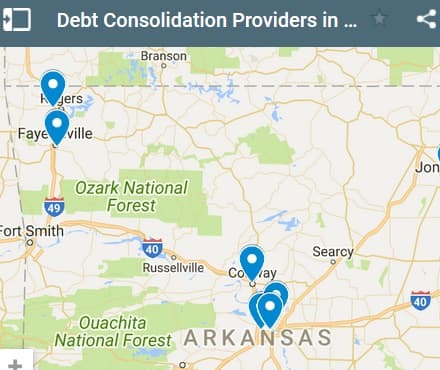 Some of the debt consolidation providers listed above and in the map are not based in Arkansas. A American serves these Arkansas communities, but is not actually based there. It doesn't mean their service isn't worthy of consideration though. It's important to read all of the documentation of any loan agreement before you sign the dotted line. Make sure the service you employ doesn't just end up making your debt problems worse. There are some companies that don't really help you consolidate your debt and you should avoid them. Dorothy from Little Rock needs a small debt consolidation loan to combine her credit card debt and a pay day loan into one low interest loan with one monthly payment. She has two credit cards that she is carrying a balance of $5000. She did not have enough funds to pay her rent this past month and went to get a small loan from a local lender to tide her over until her pay check arrives. She knows that going to a pay day loan lender is not really the best approach to take. Between the fees and the high interest, she is paying on this loan and also on her credit cards, she is paying far more than a loan would ever cost. She spent too much money over the past couple of months and suddenly she realized that she did not have enough money in her checking account to cover the payments that were due let alone paying the full balance. She has a full time job and generally a good credit rating. Her credit score has been up and down over the past few years, mainly in the midrange. She had a few issues a few years ago, however over time they are expunged from your score provided they are not major issues like bankruptcy. She had applied for more credit cards than she needed. Every enquiry to a credit score agency generates a negative impact on your credit score. She has not missed any payments for rent, utilities or for debts that she has. Dealing with this latest debt cash flow issue has really scared her and she vows that she will never get into this situation again. She has applied for a $5.5k loan with a four year term to keep her monthly payments manageable. Dorothy should quickly pay off the payday loan as her first priority. It is costing her the most money in terms of fees and interest charges. She has two credit cards. On is a traditional credit card that charges 19% interest on overdue balances. The other is a store credit card and this card charges a hefty 29% interest on overdue balances. Obviously this should be the next one to repay on her priority list. Always paying the highest costing debt first unless there are other personal factors that might dictate otherwise. Dorothy applied for a $5500 debt consolidation loan which will have a relatively small monthly payment and much lower interest rate as well. She wants to pay it off in four years, however we suggest that she try to repay it more quickly to reduce her overall interest charges. She also needs to pay more attention to what she spends and also managing her cash flow to avoid falling into the same financial debt trap she in now. She would be better off to only use the traditional credit card and perhaps leave the store based credit card at home. 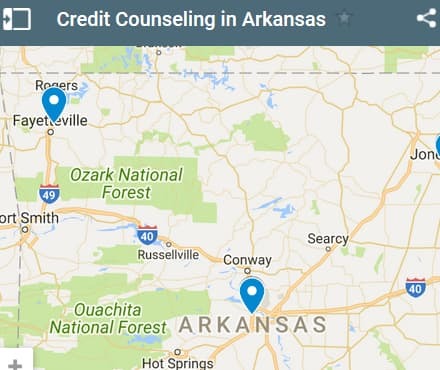 If you live in the State of Arkansas and you're trying to get approved for a debt consolidation loan, we hope our website helps you find a good lender regardless of your credit rating.